Dayton State Park is one of the smallest state preserves in Nevada (152 acres), occupying a half mile square of land on the west bank of the Carson River just north of the center of the small town of Dayton, bisected both by the four-lane highway US 50 and an older alignment of this road, to the west. 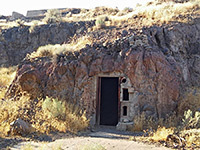 The park contains two main attractions; the river itself, flowing through a sandy corridor overgrown with trees and bushes, and, on the opposite side of the highway, the remains of an 1860s silver ore processing operation, Rock Point Stamp Mill. 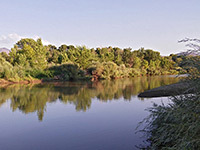 The surviving elements of the mill are mostly made of concrete, and although extensive, are not especially photogenic, while the neighboring section of the river is not much different to other parts, hence the state park is not a major attraction, popular mostly as a pleasant day-use area, with picnic tables, bbq grills and short trails through the riparian surroundings. It also contains a group event facility and a ten-site campground, accommodating RVs up to 34 feet in length. The Carson River valley in and around Dayton has a relatively low elevation, remaining largely snow free in winter, yet the land begins to slope up significantly not far west and so this region provided a good resting place for pioneers heading to California, across the Sierra Nevada. In 1849 one such traveler, Abner Blackburn, discovered gold nearby, and other prospecting, later mostly for silver, took place over the next decade, the majority associated with the Comstock Lode, in Virginia Mountains to the northwest. A number of stamp mills were built in the neighborhood, all using water from the river, and Rock Point was one of the largest, situated just north of a small settlement that was initially named Hall's Station, becoming Dayton in 1861, after local surveyor John Day. The town quickly grew, as more mine workers arrived, until a combination of several destructive fires and depletion of the ore precipitated a gradual decline, towards the end of the century. The mill was also damaged on two occasions, though was rebuilt and continued in operation until the 1920s when the reusable elements were dismantled, and taken to Silver City. What remained was mostly foundations and other concrete structures, and these are little-changed to this day. The park adjoins the north edge of town, just beyond Gold Ranch Casino. A small amount of roadside parking is available near the old mill along US 50, from where the ruins can be seen a short distance up a sparsely-vegetated hillside - a polygonal water tank, parts of wooden flumes and a row of emplacements (stamp battery footings), surrounded by walls and lines of stones, while beyond is a network of paths, some smaller concrete items and old trash piles, all spread out over an area of 350 feet square. 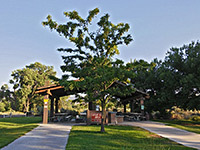 Most visitors though see only the other half of the park, east of the highway, accessed by a short road that winds through the willow and cottonwood woodland, past the campsite, to a parking area in front of the group facility. Paths lead to and along the river, which used to flow right beside the road but was diverted about 500 feet east following a major flood in 1997. The mill site is accessible by a path that crosses the highway via a low underpass.